Y.S. 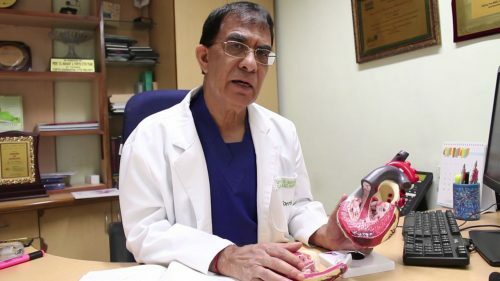 RANA, CHANDIGARH—Although he has done a number of open heart surgeries yet he recalls in vivid details, the rare surgery he performed on 11-month-old Junaid from Pakistan under the Rotary Heartline Project which gave the child a new lease of life. He is Dr T.S Mahant, whom people consider next to God. Once a small town boy of Himachal Pradesh, has made a name for himself in the medical profession not only in the country but at global level with his grit, determination, devotion and perseverance. Dr Mahant performs multi-vessel bypass procedures on beating heart in patients with various co-morbidities, including acute myocardial infraction and ischemic heart failure. It is for this brilliance that awards always find their way onto Dr Mahants shelves. From the Outstanding Humanitarian Award by Rwanda High Commission in 2014, to Paul Harris Fellow by The Rotary Foundation of Rotary International in 2011, the appreciations have never stopped flowing. Closer home, he was been felicitated with the Lifetime Achievement Award for Meritorious Contribution Towards Human Services by CMA, Lifetime Achievement Award for Medical Tourism in 2014, Dhanwantari Award by NIMA, Award of Honour by International Punjabi Chamber for Service Industry during Punjab Parvasi Diwas, Himachal Rattan Award, and many honours by the Rotary Club. In 2015 he was awarded Global Healthcare Excellence Award for being the Best Cardio Thoracic Surgeon in North India. In 2016 he received the Bharat Jyoti Award for meritorious services by IIFS. Dr Mahant has also been given the honour of being Honorary Advisor to Government of Himachal Pradesh, besides being External Examiner in the Specialty of Cardiovascular and Thoracic Surgery for MCh and National Board of Examinations, (DNB). Blessed with not only a brilliant mind, but also a benevolent heart, he has been the champion of many charitable ventures at Fortis Healthcare. Started under his leadership, the Rotary Heartline Project has seen over 450 children from underprivileged background avail free surgeries. Children from Rwanda, Afghanistan, Nepal, Pakistan, Bangladesh and India have benefitted. He is involved in social ventures under Red Cross, HP and Punjab Government initiatives for BPL families and projects like Quark Prayas, apart from Fortis Chetna programme for saving the girl child. Following the dictum of Simple living, High thinking, Dr Mahant continues to save precious lives through his invaluable contribution to the society.